After last nights near constant rain, it was pleasant to hear no rain on the tent when I woke up at around 6:30 ish due to the daylight. After failing to get back to sleep, I went outside to discover that most of the cloud had lifted and there were even a few patches of blue sky :-) It was noticeably colder than yesterday though; my thermometer in the tent porch read 5°C, so it can't have been much above freezing overnight! Gwilym had brought along some backpacking coffee he had found in Tiso so we had an unusually civilised start to the day with freshly brewed coffee! By the time we were packing up the tent the cloud had pretty much lifted above all the peaks we could see, and we could admire the majesty of our location next to Loch Etchachan. Our original plan had been to bag Beinn Mheadhoin as a there and back walk from Loch Etchachan before descending into the head of Glen Derry and then ascending alongside the Glas Allt Mor up to the Moine Bealach. However when viewed from Derry Cairngorm yesterday this burn didn't look to be an attractive route of ascent as it appeared to be in a quite steep sided little gully. So instead as the weather was so good we opted to take in the extra peak of Beinn a' Chaorainn. Therefore after packing the tent up we began the steep ascent up onto the plateau of Beinn Mheadhoin, with excellent views back over Loch Etchachan towards Ben Macdui and the crags above Loch Avon. We continued over the plateau past several granite tors to reach the summit tor of Beinn Mheadhoin (Munro, Marilyn), which was an impressively large lump of granite. I had been here previously, but declined to scramble up the summit tor that time due to it being plastered in ice. However that wasn't going to be a problem today and after a relatively easy scramble we were soon on the ~4x4m flat top of the tor, where we met our first other walker of the day. The views up here were excellent, and we rested a while in the warm sunshine, although there was also a chilly breeze. The descent of the tor was unsurprisingly trickier than the ascent, with one slightly off balance move. However we were soon safely back on the ground, but I was glad I hadn't attempted it when I was here in winter some years ago! The descent down to the north east took quite a while due to having to avoid a number of crags, and the ground being quite steep, broken and heathery; perhaps a route to avoid in mist! We stopped for a break part way down in a sunny sheltered spot to remove layers as it had warmed up significantly. And by now I concluded that it was a tad too warm to be wearing leggings under my trousers, although their warmth had been much appreciated first thing this morning! Eventually we reached the midge ridden path through the Lairig an Laoigh, where we detoured south briefly to pick up more water as it was so hot! After following the path northwards for a few hundred metres, we took a traversing line up through the heather onto the steep northern slopes of Beinn a' Chaorainn. The ascent seemed to go on for ages, and as we were sheltered from the wind we dared not stop for long lest the midges find us! Higher up the ground began to ease and after a final ascent up bouldery slopes we reached the summit cairn of Beinn a' Chaorainn (Munro, Marilyn) and our second other walker of the day, who had walked in this morning. As it was now well past one o'clock, and we were both quite hungry, we stopped here for lunch in the sunshine :-) The views from here were excellent: we could pick out all our hills from yesterday along with many others much further away; we could also make out the Moray Firth in the distance. After a walk across the seemingly endless plateau of the Moine Bhealaidh, which was boggy in places, we began the ascent up to our final hill of the day: Beinn Bhreac (Munro), whose summit we reached at around 2:30pm. Again the views from here were excellent and we took possibly our last opportunity for a midge free break! We descended south before picking up a small path down to the 673m bealach and then on downwards over progressively boggier ground to reach the easternmost of the two main paths through Glen Derry. We headed southwards on this much better path through the pinewoods, surrounded by heather resplendent in purple flowers to reach Derry Lodge. Here we met several day walkers preparing to cycle back to Linn of Dee; we were envious as we would have to walk the 5km instead! More photos and route map will follow once I get home. Post updated on 01/09/12 to include route map, photos and links to hills; post date also altered to actual date of walk (from 27/08/12). We set off this morning from Linn of Dee soon after half nine surrounded by a large swarm of evil midges. However it soon became apparent that if we walked fast enough they didn't seem to be able to keep up; so that's what we did! Soon it began to rain, which it continued doing until around Derry Lodge. We dared not take a break as the midges would soon find us, so we pressed on over the boggy ground in improving weather to reach a better path a few hundred metres away. It is somewhat perplexing that this path was so well maintained yet the previous section wasn't. After passing what looked to be a DofE group out on expedition, a breeze soon appeared and we felt it was safe for a break! And it was :-) The rivers didn't seem too high so we decided to take the shorter option of fording the Luibeg Burn, which didn't prove too tricky today. We refilled our water bottles and begin the ascent of our first hill in earnest, on a surprising good path, with a strengthening wind. The low cloud seemed to be gradually lifting, with good views towards the hills south of the Dee and also back towards Derry Lodge. After much steep ascent, the ground gradually began to ease and we found a reasonably sheltered spot to have lunch a few hundred metres short of the summit of Carn a' Mhaim. After feeling suitably refreshed for the daunting climb ahead, we ambled over to the summit cairn of Carn a' Mhaim (Munro, Marilyn) to admire the fantastic views, although they were a bit intermittent! Strangely it didn't seem to be particularly windy here despite the exposed location. We descended the pleasant north ridge of the hill, which seemed to be acting as a barrier for the cloud, as there was loads of low cloud to the west but little to the east. 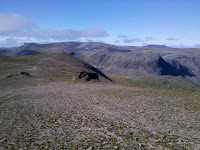 The scree and bouldery ground was unpleasant to ascend, but eventually we reached the Cairngorm plateau at around 1200m. A kilometre or so of more gentle ascent brought us to the summit trig point on Ben Macdui (Munro, Marilyn), the second highest hill in the UK. There was a handy viewpoint indicator that told us all the far off hills we would be able to see from here on a clear day, including the Pentland Hills and Ben More Assant! 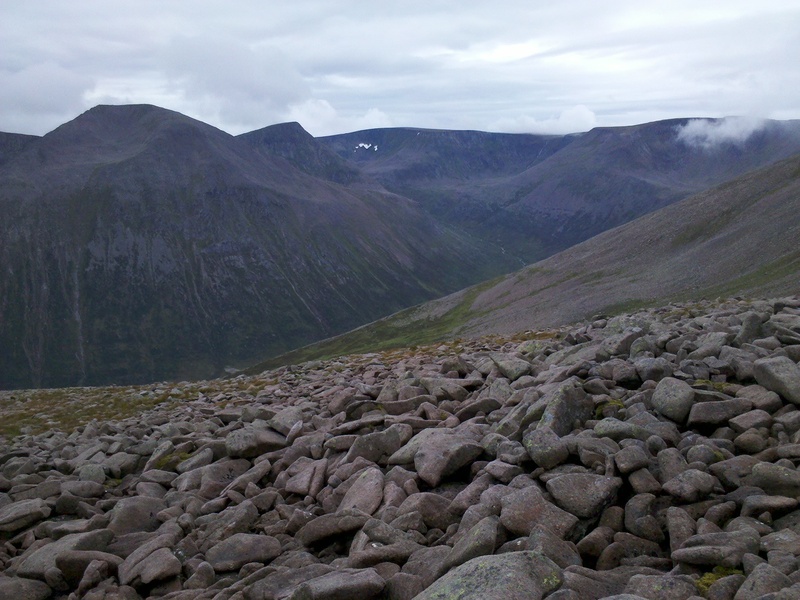 Due to the cloud not having completed cleared Ben Macdui, our only view today was across the Lairig Ghru. After a bit of a rest, we descended west, then north west, on an improving path. Soon we dropped back out of the cloud and there were good views down to Loch Etchachan, our planned camping spot for the evening. 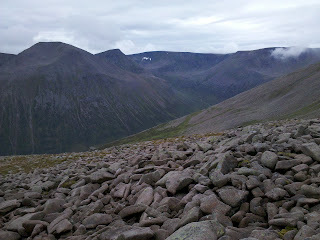 However we still had another hill to climb today: Derry Cairngorm. Therefore we left the path and headed south. Shortly before the bealach we left our sacks to avoid lugging them unnecessarily up the hill. 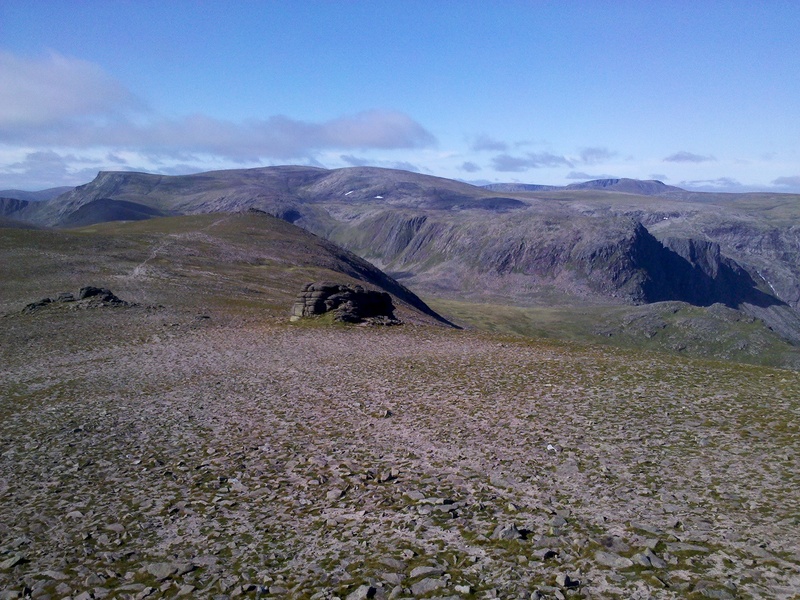 There were two summit cairns on Derry Cairngorm (Munro, HuMP), which appeared to be of near equal height so we visited them both just to be sure! There were good views from here over to Lochan Uaine and the impressive looking crags on the south east side of Ben Macdui. Over to the north east the sky was turning darker indicating rain was on it's way; would we get the tent up before its arrival? After returning to our bags, we began the sort ascent to the summit of Creagan a' Choire Etchachan (Munro Top). Soon it began to rain, and it soon turned heavy and persistent. We descended north west to pick up some water near the head of Loch Etchachan, before trying to find a flat area to camp that wasn't boggy and/or covered in stones. Eventually we found somewhere near the spit of land which almost separates the Loch in two. Soon we had the tent up and retreated inside from the incessant rain at around 7pm. Dinner was couscous followed by a choice of single malt :-) It was still raining when I went to bed at 10 ish; I hoped tomorrow would be drier than this evening! More photos and a route map will follow once I'm back home. Post updated on 01/09/12 to include route map, photos and links to hills; post date also altered to actual date of walk (from 26/08/12 due to lack of signal). As it was warm and sunny today, we decided to head to Tatton Park for a morning walk based on one in our Cheshire ATP walks book. However as we approached the park, we regretted not having checked the events schedule in advance as it turned out there was a large VW festival taking place there today! Therefore we were directed to park in a busy field on the edge of the park; however once we escaped the area where the festival was taking place it was much quieter. There appeared to be some sort of art festival taking place at the moment with various installations dotted around the park, including this flying saucer above. We wandered down past Melchett Mere and into the pleasant Crow Wood, before picking up a track past the Old Hall and lots of deer. From here we took a wide arc across the parkland to reach another art installation: a deer painted onto a broken aircraft's tail fin. We returned to the car by walking alongside the very busy road through the park, which appeared to be a near constant traffic jam presumably due to the festival; however luckily we were able to avoid this on our way out of the park!